Asparagus is full of vitamins A, C, E, K, and B6, as well as folate, iron, copper, calcium, protein, and fibre. It’s a natural diuretic so helps keep your urinary tract healthy and can assist with weight loss as it only contains 20 calories per 100 grams. It’s also believed to be an aphrodisiac and helps boost your overall mood as it contains high levels of tryptophan. It’s peak season now so Andrew went to Groombridge to interview local grower, Michael Bourne. Michael is a member of the Asparagus Growers Association and is the owner of New Park Farm and based in Groombridge, Kent. How long have you been at the current site growing asparagus and was this where you grew your first crop? 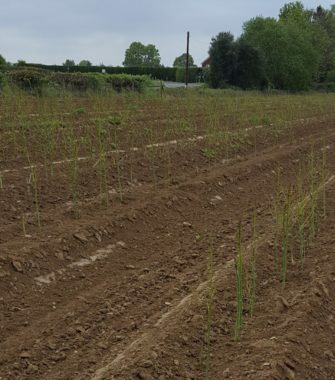 I have been at New Park Farm for the last 12 years and was at a previous farm in Groombridge for 10 years growing asparagus. Therefore a total of 22 years. New Park Farm has ideal soil which is free draining, south facing and sandy loam although asparagus will grow on most soils. Why did you start growing asparagus? When I was young I grew up next to an asparagus Farm where they offered it to customers at their gate and the queue stretched down past my house. I therefore thought there must be something in this product due to its popularity. Asparagus is the first of our English vegetables so everyone became very enthused about it particularly as it has such a wonderful flavour. It is also quite a niche market so much so that when I started growing asparagus only 30% of the population ate it. This has now increased to 60%. I therefore saw this as an opportunity to produce a high valued product which I started when I had a farm of my own. How many acres do you allocate on your Farm to growing asparagus and how many fields do you have? We have 14 acres of which 5 acres is on somebody else’s Farm. New Park Farm has 56 acres to rotate 13 to 14 acres of asparagus around. We also have horses on the farm so we have a good rotation of grass and horses muck which assists asparagus growth. What is the season for growing asparagus? The normal season for asparagus in the UK is from end of April to the latter part of June although due to the warm Spring weather we had in March this year the first asparagus was cut on 8th April. The last time this happened was back in 2011. What is the difference between white and green asparagus and does this differ in flavour? There really is no difference at all and the varieties remain the same. It is more the way you treat them. The continentals ridge their asparagus with greater mounds than we do and they cut their asparagus before it turns green. If you look at my asparagus it starts with being purple and as the spear grows it turns green. On the continent as soon as they see a purple spear they go down into the ground and cut it with a long asparagus knife. The asparagus therefore does not see any light, air or sunshine and hence it remains white. I believe green asparagus has more flavour because it is growing in natural conditions. Also white asparagus is generally peeled because it is stringy. 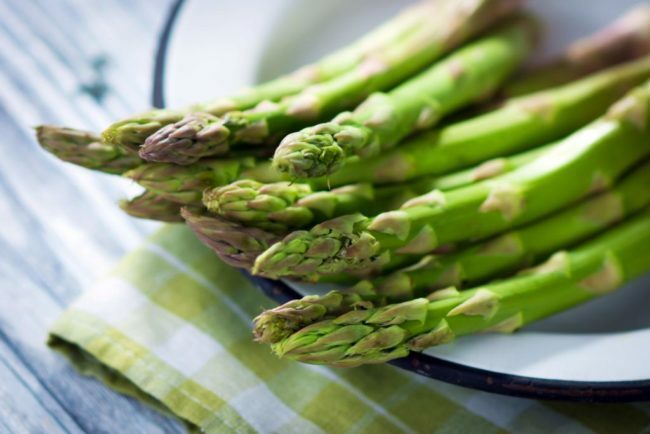 What are the benefits of eating asparagus and does it improve your health? It changes your physical condition quite a bit and it also cleans your kidney’s out allowing your organs not to work as hard. It is said to be anti-carcinogenic and it is a green vegetable which is good for you. What is the best way to prepare and cook asparagus and how do you personally enjoy it most? Steam it, micro wave it, BBQ it or grill it. The choice is yours! What’s important is to cook the bottom part of it twice as long as the top half. The bottom half needs to sit in a pan with two inches of boiling water in it and the top half is just allowed to steam. (Pan is covered with a lid) The asparagus is ready to be served once it reaches aldente or crunchy (6 – 7 minutes). So many times asparagus is over cooked because all the asparagus is immersed in boiling water which also means you lose all the flavour and goodness. I like my asparagus with either Hollandaise or freshly melted butter. Weather is a key factor in growing any vegetable. What are the ideal conditions and the worst conditions for asparagus growth? The worst weather conditions were experienced a week ago when we had temperatures of minus 3 degrees which caused an air and ground frost resulting in the asparagus that was showing above ground to turn translucent and collapse. The ground is still currently cold with new spears taking a long time to come through. Ideal weather conditions must be warm temperatures both during the day and at night. Ideally 22 degrees during the day and 12 degree during the night. It’s a deep rooting crop so does not need lots of rain. What is it in asparagus that makes your wee smell? This is due to the asparagine ingredient in the asparagus. What on average is a good crop in terms of weight for any asparagus season? We would hope to cut two tons per acre throughout the season which is considered to be a good yield or 4lbs per plant (Crown). What makes asparagus woody and what do you look for in choosing a perfect asparagus spear? The woody bit is often white because the asparagus plant is cut two inches below the ground. At New Park Farm we cut at ground level so the complete spear is green. This means that you do not need to peel any of the plant where if it is white it does need peeling and cooking for longer. How many staff work for you during the asparagus season and are they just employed for the season? I employ four staff for the season only. How long does an asparagus plant last for? An asparagus plant lasts for about 12 years as you get die back and reduced yields which then becomes uneconomical to management and cultivate. New Asparagus is then replanted. Are you looking to expand in the future? No just enough to supply my Farm shop and take up to London. Please share your recipes with us below or on our Facebook page www.facebook.com/mustchup.